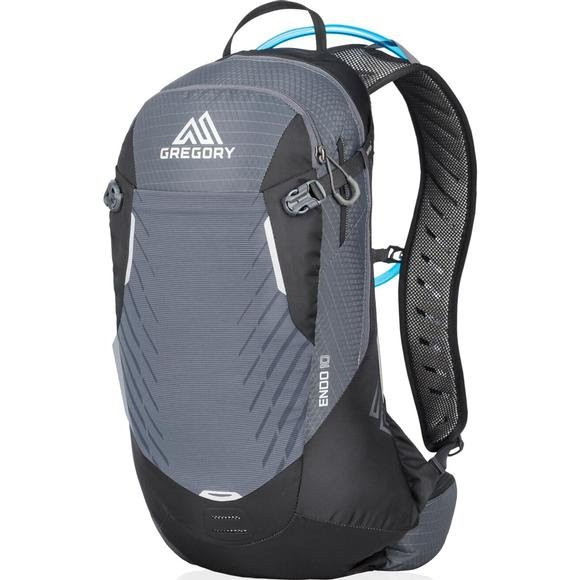 Thanks to its thoughtful organization and included tool pouch, the Gregory Endo 10 keeps tools, tubes, pumps, and an extra layer separated and close to your center of gravity. The adjustable Shift RS suspended back panel keeps the pack in the perfect position all day, while the EVAP moisture wicking back panel delivers a cool, dry ride. Thanks to its thoughtful organization and included tool pouch, the Gregory Endo 10 keeps tools, tubes, pumps, and an extra layer separated and close to your center of gravity. The adjustable Shift RS suspended back panel keeps the pack in the perfect position all day, while the EVAP moisture wicking back panel delivers a cool, dry ride. Load it up with the right gear on day one, and all you have to do is drop in more water and snacks and you&apos;re good to go. 3 liter 3D Hydro Reservoir Included. SHIFT RS SUSPENSION | with adjustable RS (Ride Stability) hipbelt stabilization system. The hipbelt can be shifted vertically to ride higher or lower on your back to provide extremely stable, no-bounce performance. This quick customization of the stabilizer belt allows you to match your fit preference to your individual riding style and trail grade. Measurements 19.3" x 9.0" x 6.7"